5"/25 (12.7 cm) Mark III gun on Vavasseur Mark I (VCPI) slide mounting. This gun was originally mounted on HMS Gannett and is now at the World Naval Base, formerly Chatham Naval Dockyard, Kent. Picture copyrighted by Bob Cordery of Colonial Wargaming. The different marks of these guns all had nearly the same ballistic performance, but they were of varying construction. They were not considered very effective and were replaced by the much better 4.7" (12 cm) QF Mark I on newer ships. A total of 112 guns were kept in storage for possible use on armed merchant cruisers until after World War I. Some surplus naval guns were allocated as coast defense drill guns, but few were actually used in that role. The Mark I had an A tube which included the breech block, 4 hoops and a trunnion hoop over the breech end. This Mark was withdrawn from service after the similar 6" (15.2 cm) Mark II failed in the corvette HMS Cordelia in 1892. The other marks had an A tube and jacket which included the breech block and included the trunnions. They differed in the number and arrangement of hoops and tubes over the A tube between the jacket and muzzle. Mark II and Mark III were later chase hooped to the muzzle while the Mark IV and V were constructed with these in place. All were originally built with three-motion breech mechanisms. Altogether, 77 Mark I, 150 Mark II, 225 Mark III, 100 Mark IV and 82 Mark V were manufactured. 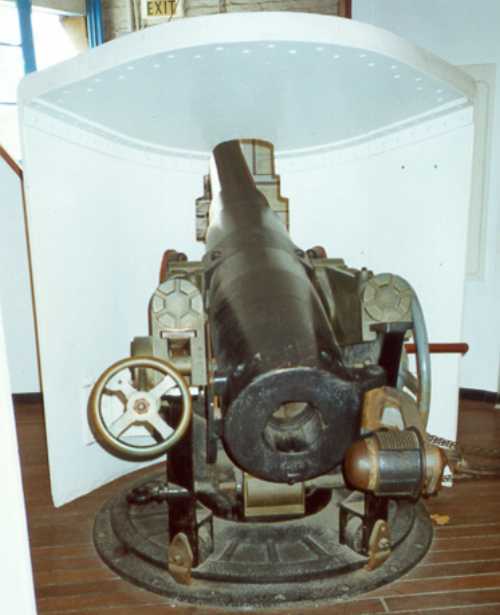 Twelve guns were later converted to drill guns by replacing the breech mechanism with a single motion Welin breech block. These were then redesignated as 5"/25 BLC Marks I/IV and Marks I/V. A breech ring was added and the trunnions repositioned. These changes also allowed an increase in muzzle velocity. One of these guns still survives in the Ordnance Museum at Priddy's Hard, Portsmouth. These guns should not be confused with the later 5" (12.7 cm) field pieces also known as 60 pdrs nor should they be confused with the Australian coast defense guns which included EOC Pattern D 5"/31 (12.7 cm) guns. The data that follows is specifically for Marks IV and V, but the other marks were similar. It had been intended to arm Nile, Trafalgar, Scout and Fearless with these guns, but they were completed with the much better 4.7" (12 cm) QF guns. BLC Mark I/IV and I/V drill guns had their muzzle velocities increased to 1,905 fps (581 mps). Data from "British Battleships:1860 - 1950." These guns were used by many of the "masted cruisers" and RML armed ironclads of the late 1800s, but I lack details as to which ones and how many guns were carried.